Beads can be used for various types of artworks or crafts, so did the paper beads. 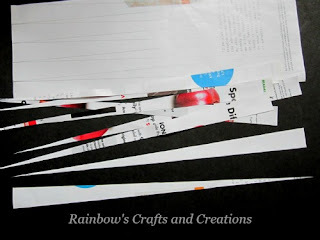 Have you ever thought of making bracelet, necklace, beaded curtain or other crafts from paper beads? You might think that the paper beads are not durable.Yes, it is not so durable if you compare them with the wooden beads, stone beads, or plastic beads. 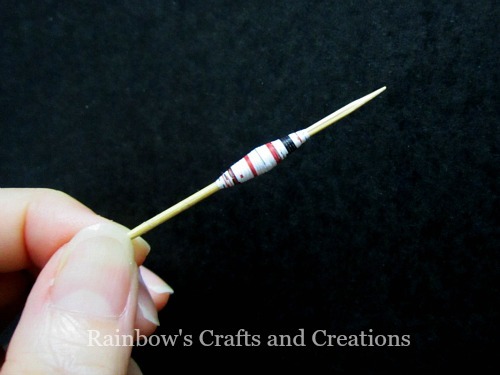 Anyway, you can make the paper bead more sturdier by adding some paint or polish over the surface. 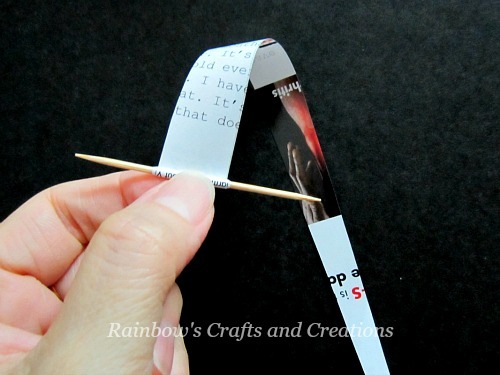 You'd be surprised that some strips of rolled-up paper can create a series of fashionable and decorative crafts. 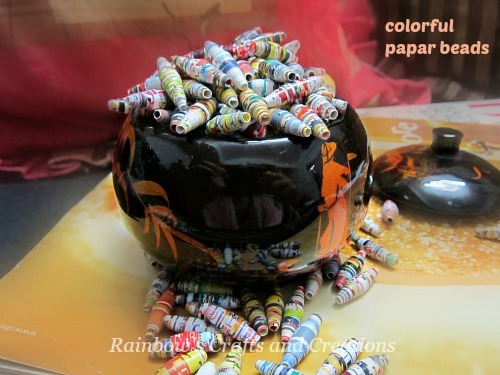 Usually, we use recycled paper such as old magazine pages, old calendars, leftover pieces of wrapping paper and etc to create colorful paper beads. To me, I like to making paper beads with old magazine pages. Let's go through the step-by-step instruction below. 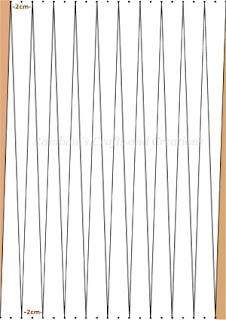 Step 1 : Draw the paper strip pattern on the paper. The picture above is an example of the pattern (long isosceles triangles). I marked a line of dots on the top and bottom edge of the paper before I drew the whole pattern. The dots should be evenly spaced apart. I made the dots 1cm apart but you can use your desired measurement. Connect the first dot at the top and the first dot at the bottom with a straight line, then, connect the first dot at the top and the third dot at the bottom to create a long isosceles triangle, after that connect the third dot at the top and the third dot at the bottom to create the second isosceles triangle and so on. Continue your drawing by referring to the example above until you have the desired number of triangles to cut out. By following the example above, you can make 20 strips and each strip can create a bead in 2cm long if you are using a piece of A4 size paper. Please excuse my poor computer artistry, you can probably draw up a better image. Anyway, you can download this pattern for your own use if you think it is useful. **note : The area with brown color is the unwanted area. 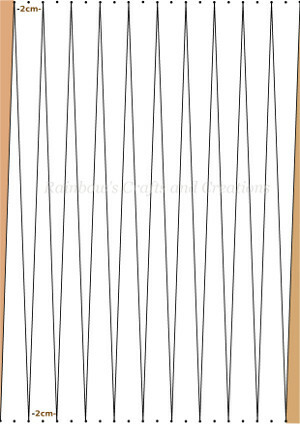 Step 2 : Carefully cut out the strips. Step 3 : Roll the wide edge of the paper strip over the toothpick. Continue rolling the paper strip around the toothpick. 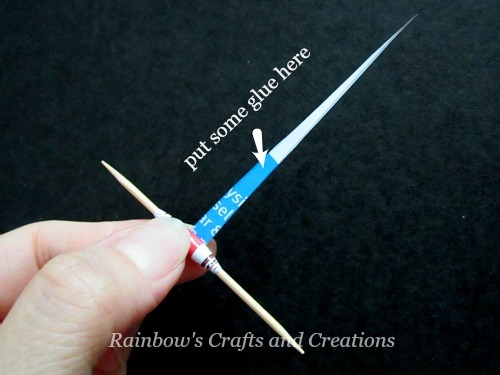 Try to keep the paper snug to the toothpick and the both sides even. Step 4 : Once you reach where about 2" from the end of the strip, apply some glue on the whole skinny part and continue rolling. Step 5: After the bead is dry, you can use any kind of varnish or polish to coat the bead before you take it off the toothpick. This is the optional step. Usually, I use the clear nail polish to coat the bead and let it dry in somewhere it won't get stuck on anything for about an hour's time. When the coating is dry, remove the bead from the toothpick. Done.